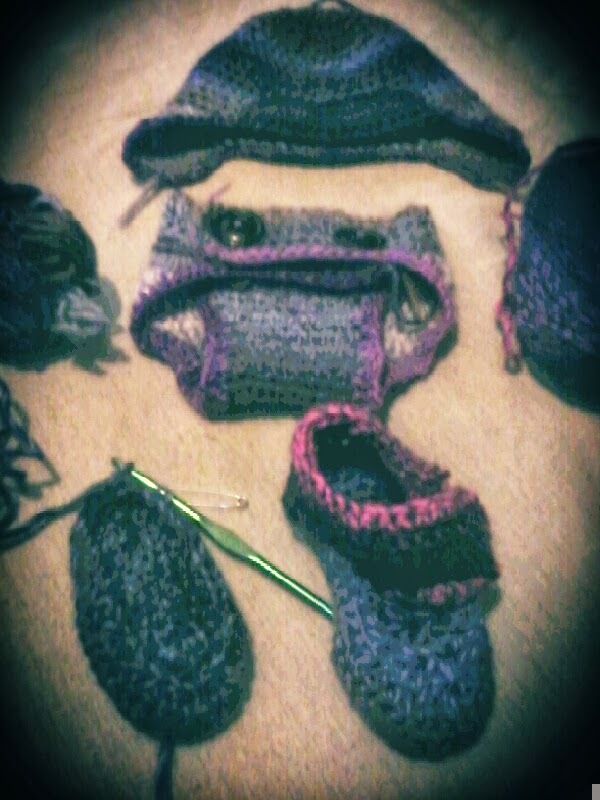 I am taking a break from finishing the second in a pair of booties for my unborn baby. The first one was a little large and lopsided. The second one is a little smaller than the first and still too big for a newborn, but it looks like it will turn out a little less lopsided. That little bootie is the last piece in the first, “set,” I am crocheting for my baby, and although the hat might be too big, the diaper cover too small (Or too itchy since I did it all in wool) and the booties a bit lopsided, I am rather proud of them. They are my first crochet-project (and a step up in complexity from the simple pouches I tend to knit for cell-phones and passports), and I feel like I am learning a critical skill. It is a bit disheartening to go to the store and see baby clothes stacked to the ceiling for under ten lev. (About $7). Onesies, jumpers, sleep sacks, booties and hats, all without the little bumps and holes my homemade set has, and all for the same price or less than I spent on the wool to knit my own. I am ruled by a need to be frugal and the frugal side of me says that it is cheaper to buy mass-produced baby clothes. My frugal side says that unless I want to figure out how to card and spin the wool coming off the sheep every spring (don’t think that hasn’t crossed my mind… I totally want to do that, someday) it is more cost effective to buy my clothes rather than crochet my own, especially when it comes to tiny baby clothes. Okay, if I was really good at knitting/crocheting/sewing then I could make some stellar clothes for me and my family that couldn’t be found in stores, but that is not the case. I am a mediocre handicrafter, and I more than likely will stay that way. So, I should forgo the crochet and just go shopping. That’s what my wallet says. My pregnant belly says something very different though. It’s not all about the money. Some parents spend thousands of dollars on their first baby. I somehow doubt it is about the money for them, either, but I know that it is definitely not about saving a few dollars on homemade booties for me. It is about nesting. Nesting can take many different forms. Some people can shop to nest, others clean to nest. I have always been more of a literal nester. My room as a child/teenager/young adult tended to resemble a chinchilla nest rather than a “respectable” human abode. Bed on the floor surrounded with twenty pillows? Yes please. More blankets? Of course I’ll take them. Books at arms reach? Check. Since I can remember I was the type of person who preferred comfort over style, and always had to have a safe space of my own. Forts turned into rooms, turned into apartments. You can imagine with that strong of a baseline nesting urge I am going a little insane during pregnancy. What causes that increase in the urge to nest? I have no idea. Maybe it is all hormonal. Maybe it is the stress of thinking about bringing another life into the world that is dependent on me. Maybe it is some combination. Whatever it is, nesting-syndrome has already hit me hard, and I am only starting my sixth month. If I was to purchase my way through these nesting cravings then our house would be full and our bank account empty by the time I hit the seventh month. (Have I mentioned that these urges to nest are strong?) So, I took up crochet. I find it relaxing to sit, listening to music and counting stitches, and watch something adorable and tiny take shape from my hands. The one time I went to a baby store I was overwhelmed and a little sickened by the time I left. I am pretty sure inducing a panic-attack through the endless consumer-choice in the realm of baby, “stuff,” isn’t doing nearly as much to help these nesting urges as taking that nervous energy and making stuff. So, that’s why I am making my diapers, and diaper covers, and sleep sacks, and whatever else I can find within my skill level by the time the baby is born (and after, if I find time and energy). Sure, it is a little about money. It is a little about my desire to recycle old clothes, and to start our family off with a respect for natural materials and knowing the source of things in our lives. It is a little about labor and not trusting the “fair-trade” label. But really, ultimately, it is about me satisfying a deep, driving desire to have control over something for an hour a day, when I am terrified of what the future might hold. (Terrified and SO VERY excited).